The name of Oregano literally translates from Greek as “joy of the mountain.” In Greek mythology, the king of Cyprus had a servant, Amarakos, who after dropping a jar of precious perfume was punished by the gods who changed him into an oregano plant. Venus was the first to grow it in her garden. Oregano is a perennial plant, and will take over in the garden if given the opportunity. Put in an area that has room for it to spread, or plant in a large pot to limit the amount of space it needs. As with many herbs, oregano is easy to grow. Much like herbs, different varieties of oregano can have different flavors to them. Many first time gardeners like to plant starts from a garden center, instead of sowing seeds. This way they have the opportunity to smell and taste the plant, to select the one they prefer. Oregano can be transplanted in mid spring, 2 weeks before the last frost. 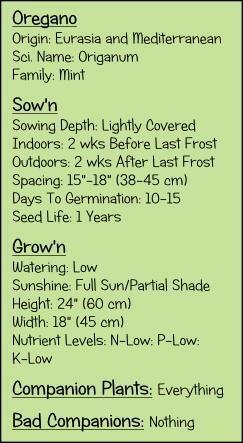 It can tolerate some frost, but if hard freeze is forecasted, cover the plants. Plants should be planted 12 inches (30 cm) apart or in pots. 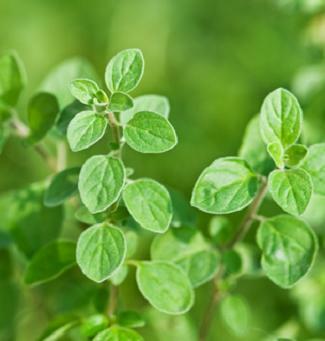 Oregano needs light watering and shouldn’t need any additional fertilizing. It is one of the few plants that can be planted with anything. Oregano leaves can be harvested, as you need them, or harvested all at once for preserving. They can be used fresh or dried, and stored in jars. They can also be frozen to preserve. To freeze, first wash the oregano and pat dry, snip in small pieces and pack in bags, making sure to press all the air out, and freeze. To dry oregano, first wash them thoroughly then place them in a dehydrator or oven at 110 degrees F (43 degrees C) for 4-6 hours. Store dried oregano in a glass jar. Dried oregano makes a great addition to soups and in many Italian dishes.